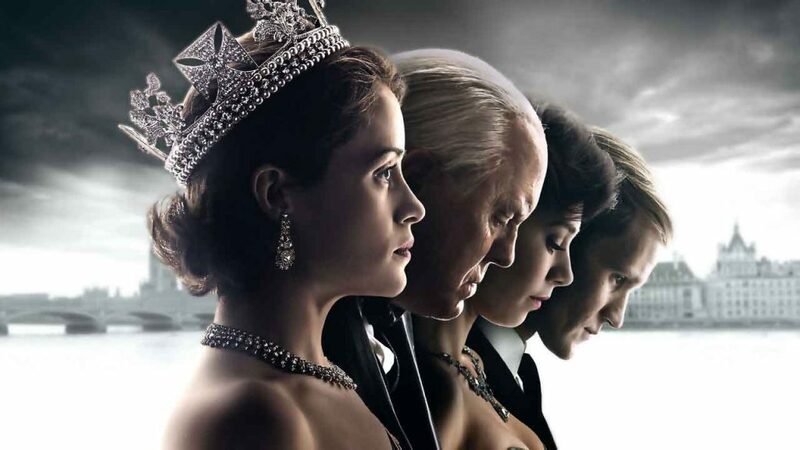 A scene for The Crown is being filmed on St George’s Drive on Sunday 30th April and will involve some road closures around the Warwick Square section of St George’s Drive between Warwick Way and Gloucester Street. The production is keen for the day to run smoothly and is working with Pimlico resident’s associations and WCC. Residents and organisations in the area should have received notification letters from Left Bank Productions (LBP). Production crew members have organised a drop-in meeting at St Gabriel’s Church on Thursday 20th April 20:00—21:00 for locals to discuss any aspects of the shoot that might affect them. The production team have responded our list of queries with a draft schedule and more detailed information about the day of filming. If you live in the filming zone or nearby, please read The Crown – Schedule & Info and plan ahead..
Here’s a draft map showing proposed parking suspensions. The map shows suspensions requested by the production team after recent discussions with WCC. 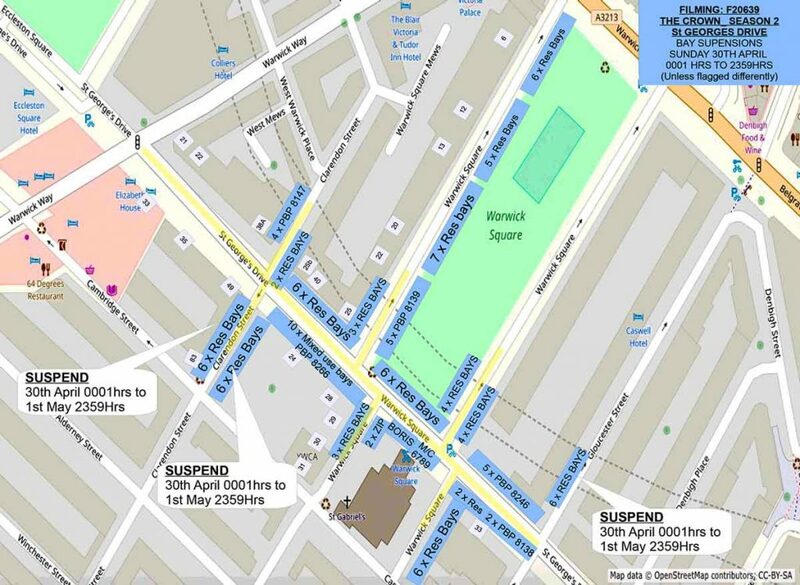 Parking Suspensions (BLUE) are mostly from 00:01 to 23:59 on Sun 30th with 3 marked areas extended to 23:59 on Mon 1st May. Best to park elsewhere from Saturday. Road Closures (YELLOW) are from 16:00 – 23:59 on Sun 30th St on George’s Drive from Warwick Way to Gloucester St plus sections of side streets between those points. Q-Park alternative parking for impacted residents: details coming soon via this post and newsletter. Residents and businesses who can’t find nearby parking for their vehicles may use Q-Park Winchester Street (North end), London SW1V 4JQ. More details in The Crown – Schedule & Info. Vehicles and equipment may begin moving into parking bays from 08:00 onward. The road will be closed at 16:00 for rehearsals, actual filming is planned to start at 19:00. The schedule may change slightly on the day. Comments welcome, below. Specific queries or concerns, please contact me! If you haven’t already, please subscribe to 5Fields.org to get updates via email. View the email Newsletter sent out to subscribers. The Crown is produced by Left Bank Pictures. Separator image Posted in Transport and tagged with traffic. The Crown drop-in meeting at St Gabriel’s Church on Thursday 20th April is from 20:00—21:00 not from 18:00 as previously stated!